You are here: Home / Central America / Guatemala / Lago de Atilan, Guatemala. I’d read about it in the guidebooks. Nearly everyone who’d been to Guatemala raved about it yet arriving in the dark last night I had no idea until I woke the next morning and gazed over this beautiful lake flanked by three ominous volcanoes. 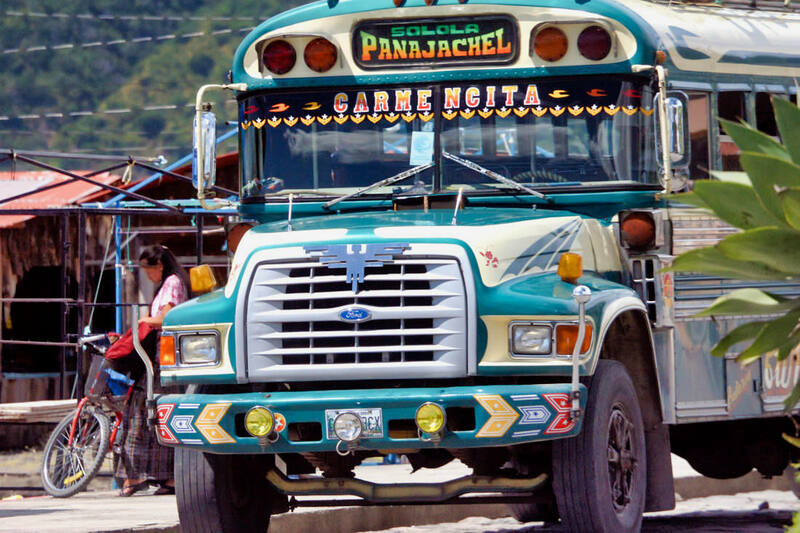 For two nights I stayed in Panajachel where I saw more tourists than perhaps anywhere else on my journey. Though Oaxaca comes close. A beautiful volcanic lake sitting about 7,000 feet above seal level Panajachel has long been on the travelers circuit since the 60’s. Its early years perhaps tainted or praised for its easy access to drugs, today Pana, as it’s referred to by travelers and locals alike, is a shopping mecca for Guatemalan handicrafts. Restaurants are first class and accommodations run from the cheapest to the most expensive in Guatemala. But it’s the cheap living that attracts most travelers. The main drag that starts or ends on the lake is littered with handicraft shops, cafes and restaurants. 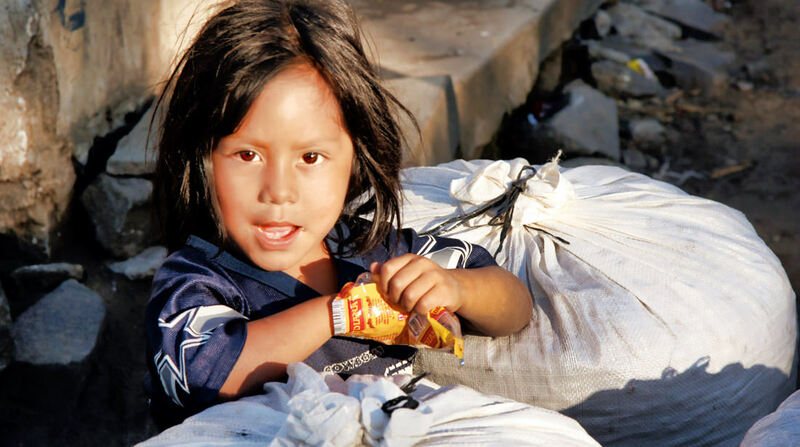 Mayan girls and older woman taunt tourists in restaurants with weavings, necklaces and other handicrafts while young boys 9-14 years old tote shine boxes looking to polish the boots and shoes of travelers for a mere 3 Quetzales (about 40 cents). Walking down this busy street I heard a familiar voice, “Allan! ?” It’s Dave Welton of the infamous Dave and Deb duo I met and rode with from Creel to Zacatecas. I hadn’t seen them in nearly two weeks and here they are in Panajachel. The two of them are taking the world on BMW F650GS’s. After selling their home and all of their possessions, they mounted their bikes and headed south. They are not sure how far they’ll go or where they go next. 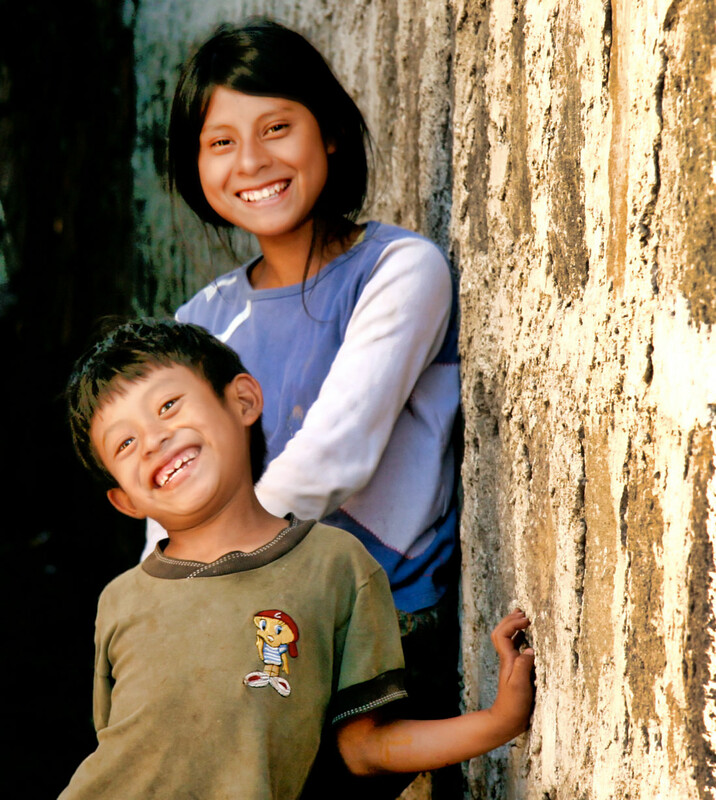 But both are alive with an adventurous spirit and braving the villages and cities of Mexico. While our time together amounted to merely a few days, it feels like running into old friends after only a few weeks of wandering the villages of lands unknown. Yet despite the constant sales push of the local people, Pana is a place one could hang for a while. Dave and Deb plan to stay for a week taking Spanish classes. Nearby, other villages such as San Pedro, Santiago Atilan and Santa Catarina on Lago de Atilan are accessible by road but to truly experience the villages of Lago de Atilan is to take water taxis or charter a boat. at about 12 miles long and 6 miles across the shores are punctuated by steep hills and three volcanoes. Depending on the position of the sun, the lakes water changes from deep blues to steely grey and green. Unfortunately, Hurricane Stan in early October unleashed its wrath on Pana and many of the 14 villages sitting on the shores and in the hills above the lake. A small river running west of town couldn’t handle the massive rains and its shores collapsed taking with it dozens of homes, businesses and the only bridge carrying pedestrian and vehicular traffic to the outskirts of the town. Even worse, a small village of Panabaj made international news as a huge mudslide took out hundreds of houses and killing nearly 2,000 people. 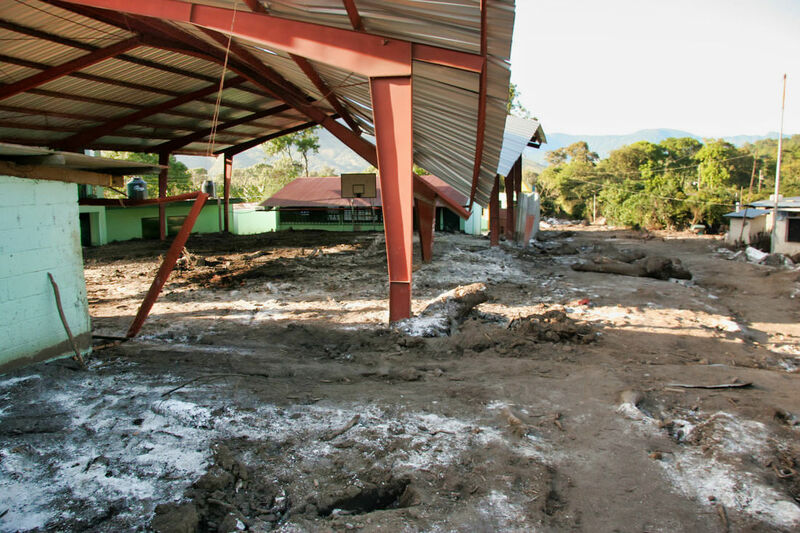 In my trip to the site of the mudslide I was sickened by the site of lime spread on the ground. While I know the bodies of many buried deep in the mud were never excavated, I’m just not sure of the effect of the lime. I could see just the roofs of buildings and timber strewn everywhere. Crosses and small monuments covered by the remains of corrugated tin roofs dotted the landscape of a large clearing where many homes were buried. One man I met was chopping would and tending fire around a small enclave walled by the corrugated tin. A woven blanket and a few items of dirt clogged clothes were piled in the corner. He explained to me that he lost his home, his wife and two of his children. One boy with him appeared to be a surviving son. I couldn’t must the Spanish to ask him how he survived. My heart sank deep and I handed him the loose Quetzale coins that were clanking in my pocket as I wondered through the wasteland of destruction and death. 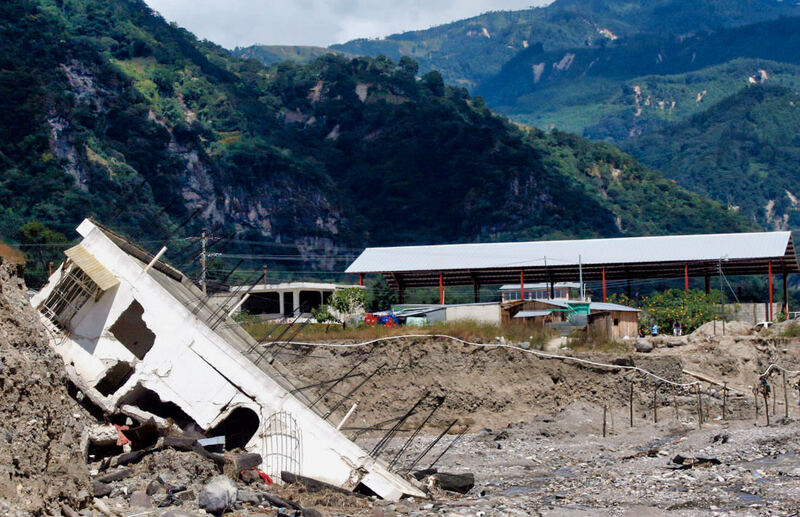 I learned that rather than rebuild the community under the mudslide, the local people and government have agreed to dedicate the area as sacred ground. As I walked back toward the lake I couldn’t help but notice the elevated spirit of the children kicking balls, riding their bikes and laughing and giggling. Older people climbing down from the mountain with sacks on their back carrying fruit from coffee plants bring their harvest to homes still standing to have their take weighed and converted to cash. A large sack of coffee sitting about 4 feet high and four feet in circumference fetches $20 or $30 depending on the weight. My guess it would take days to fill one of these sacks. I made my way back to the boat glancing over my shoulder at the gouge in the mountain above me wondering if those people buried ever saw what was coming. 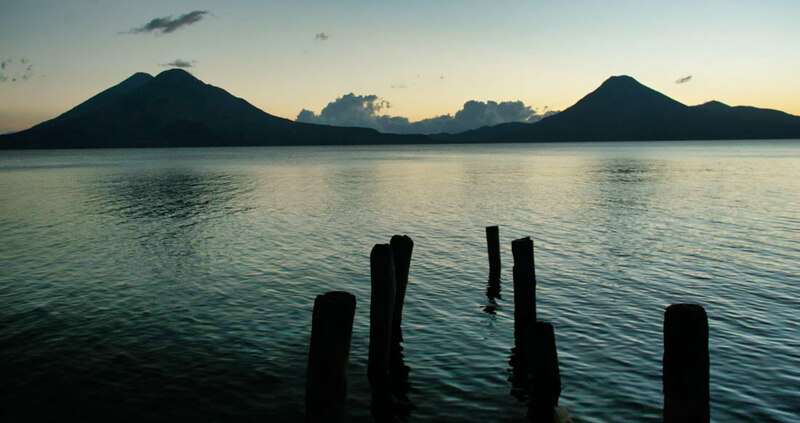 Photos: (1) The captivating evening over still waters at Lago de Atilan, Guatemala; (2 &3) The colorful moto-taxis and classic Guatemalan buses set the mood for journeying through Guatemala; (4) Panajachel river damage from Hurricane Stan in October 2005; (5) The fatal path of the mudslide that buried Panabaj, Guatemala on the shores of Lake Atilan taking 1,400 or more lives with it; (6) To be decreed sacred ground, remnants of homes lost form the frame for the buried alive; (7 & 8) innocence and smiles, these kids play ball and goof around on the dried mud that took neighbors, family members and friends, note the sacks of coffee the girl in photo 8 is leaning on; (9) school drowned in mud. note the basket ball court, only about 4 feet from ground to hoop; roof-line almost dragging on the mud. https://i0.wp.com/www.worldrider.com/wp-content/uploads/2014/08/atilan_sunset-tm2.jpg?fit=550%2C290 290 550 allan https://www.worldrider.com/wp-content/uploads/2014/08/worldrider_logo_white_border-trans1.png allan2005-11-09 09:55:542005-11-09 09:55:54Lago de Atilan, Guatemala. Interesting report! I would like to visit it one day. How was Your impression of the state of cvonservation of this World Heritage Site? The correct spelling, I believe, is Panabaj. 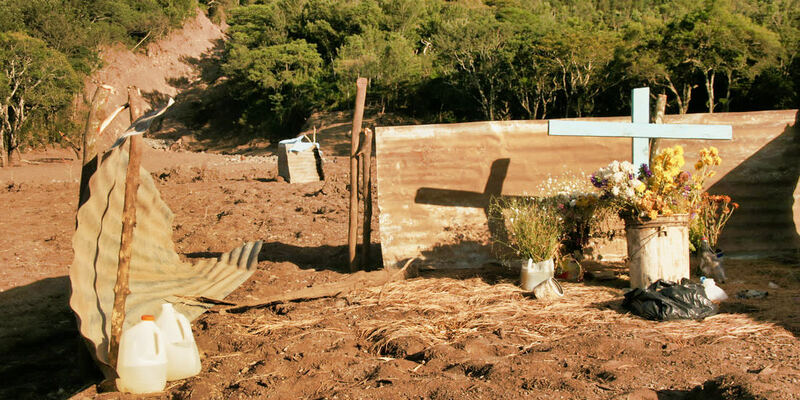 I had heard about the deadly mudslide, but did not know that the locals had decided not to rebuild, instead declaring the area sacred ground. How appropriate. What an amazing, heart-breaking, report. Allan, Thanks for sharing your journals. Your reports and photos are spell binding. Would you *please* consider having your software (Movable Type) break your journal into pages for people that are bandwidth impaired. When I check in periodically on your travels, it takes me forever to load the full single page . BTW, I *do* appreciated how you are optimizing your outstanding images. I´ve recently come through your route, Alaska in June then south Central America, then Colombia and south to Peru where I am now enjoying riding the Andes. 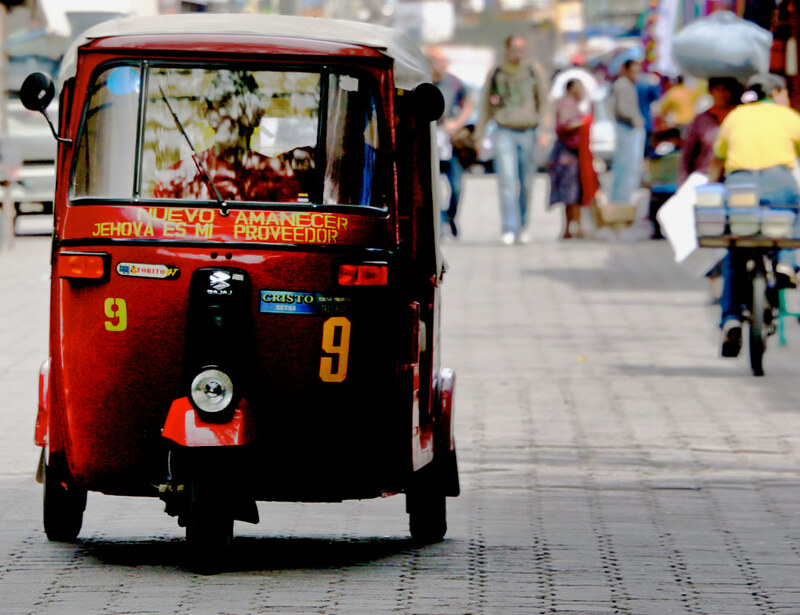 Drop me a line and/or check out http://www.oneworld-twowheels.com, perhaps there´s a few tips and tales you might enjoy…. Ooooo, and tell Sacha I´ll take the bracelets lieu of the money he owes me…. Thanks for this blog, I really enjoy reading it. I am also riding my bike from Alaska to Argentina. You probably heard about me from Jeremiah or Sacha. May be we will hook up at some point. I am in Peru with a sick bike and need time to fix it. Absolutely amazing. I keep adding more and more places to my list of destinations to visit. Sorry about the long thread. I’m working on that! But if you want to read the posts you can access the RSS feed of my site. This will give you text I believe sans photos. News readers are also called aggregators and you can find one that suits you by checking out this site! I hope to hook up with you guys in South America. Sounds great! Thanks for dropping in! Going For The Border Atilan to Antigua: Worlds Apart.